Project member/co-applicant in the NWO TOP-C1 project AVVA (2018-2022), a project on accelerating verification and verifying algorithms for verification. Principal Investigator in the EU-FP7 TETRACOM project VICTORIA (2014-2015), a project on connecting mCRL2 to Dezyne, an MDE solution. 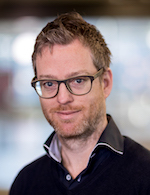 Principal Investigator in the NWO-project VOCHS (2010-2013), a project on verifying the control software of the CMS experiment at the Large Hadron Collider (CERN), using the framework of parameterised Boolean equation systems. Principal Investigator in the NWO-project COMFORTS (2006-2009), a project on verification of data-dependent and real-time systems using parameterised Boolean equation systems. At last, we have installed the proper facilities to construct counterexamples and witnesses for model checking mCRL2 specifications. A paper describing our approach will be presented at ARQNL, a workshop affiliated with FLoC, Oxford in July 2018.